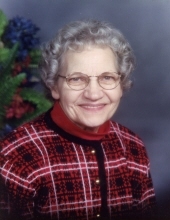 Betty Jean (DeCoto) Luce, 93, formerly of Cornell, WI passed away peacefully on Wednesday, March 20, 2019 at Mayo Health System in Eau Claire, WI. She was preceded in death by her parents, Eda Bell and Ellis DeCoto, her husband, Clyde Luce, and her siblings, Lyla Arnold, Dora Jenness, Neva Arnold, Warren DeCoto, Walter DeCoto, Paul DeCoto, Allen DeCoto, and Wilbur DeCoto. She is survived by her brother, Dan DeCoto (Shirley), her children Karen Hentz and Darlene Sadler, her 8 grandchildren, Dawn Schreiner, Mike Hentz, Shawn Sadler, Sara Knowlton, James Hentz, Heidi King, Lisa Sadler, and Rachel Sadler, her 20 great grandchildren, her 4 great-great grandchildren; and several nieces and nephews. Betty was born on October 12, 1925. She was very quiet and gentle in her demeanor but had the heart of a warrior. She had so much love for her children, grandchildren, and great grandchildren. We all knew who to call if we needed help. She was always there to help and never asked for anything in return. She was a godly woman and raised her family to serve the Lord. She was an excellent house wife and took pride in creating a beautiful home for everyone to enjoy. She taught her children how to make a house a home and have that home filled with love and respect. Betty Luce was a wonderful woman and brought a peace to any room she entered. She will be dearly missed by her family and friends. Her funeral service will be held at the New Life Alliance Church, 24288 Co Hwy Z Cornell, WI on Sunday March 31, 2019 at 2:00 pm with a luncheon to follow. There will be no visitation time prior to the funeral service. To send flowers or a remembrance gift to the family of Betty J. Luce, please visit our Tribute Store. "Email Address" would like to share the life celebration of Betty J. Luce. Click on the "link" to go to share a favorite memory or leave a condolence message for the family.